A version of hoop rolling is an ancient tradition among aboriginal peoples in many parts of the world. The game, known as hoop-and-pole, is played throughout most of Africa. It is also found on other continents. In America it has been played by a great number of unrelated native American tribes, and is known in English as hoop-and-stick or hoop-and-dart. There have been many types of hoops and rules of play. It appears that several different cultures can claim hoop rolling as their own invention. The Greeks referred to the hoop as the trochus. Hoop rolling was practiced with tumbling and dance techniques. 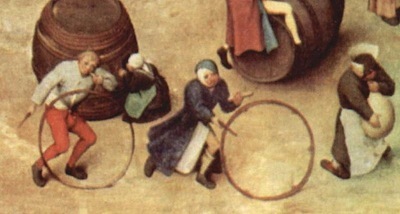 Although a popular form of recreation, hoop rolling was not featured in competition. Hoops, also called krikoi, were probably made of bronze, iron, or copper, and were driven with a stick called the elater. The hoop had to come up to the level of the chest. Greek vases generally show the elater as a short straight stick. The sport was regarded as healthful, and was recommended by Hippocrates for strengthening weak constitutions. Even very young children would play with hoops. The hoop thus held symbolic meanings in Greek mythology and culture. A bronze hoop was one of the toys of the infant Dionysus. 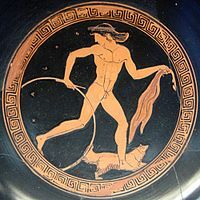 Hoop driving was attributed to Ganymede, and often depicted on Greek vase paintings from the 5th century BC. Images of the hoop are considered ancient Greek traditional art. The Romans learned hoop driving from the Greeks and generally held the sport in high regard. The Latin term for hoop is also trochus, at times referred to as the “Greek hoop.” The stick known as a clavis or radius, had the shape of a key, and was made of metal with a wooden handle. Roman hoops were fitted with metal rings that slid freely along the rim. According to Marcus Valerius Martialis (known in English as Martial) (March 1, 40 AD – between 102 and 104 AD), a Spanish poet, this was done so that the tinkling of the rings would warn passers by of the hoop’s approach: “Why do these jingling rings move about upon the rolling wheel? In order that the passers-by may get out of the way of the hoop.” He also indicated that the metal tires of wooden cart wheels could be used as hoops: “A wheel must be protected. You make me a useful present. It will be a hoop to children, but to me a tyre for my wheel.” Martial also mentions the sport was practiced by Sarmatian boys, who rolled their hoops on the frozen Danube river. According to the Augustan Age writer Strabo of Amaseia (a Greek city on the south coast of the Black Sea) (c. 64 B.C. – c. A.D. 21), one of the popular Roman venues for practicing the sport was the Campus Martius, which was large enough to accommodate a wide variety of activities. The Roman game was to roll the hoop while throwing a spear or stick through it. For Romans, this was more an entertainment and military development not a philosophical activity. Several ancient sources praise the sport. 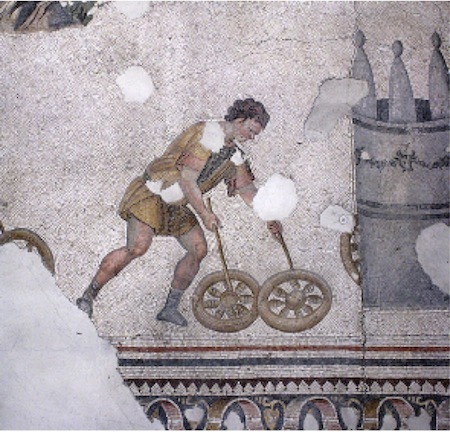 According to Horace (8 December 65 BC – 27 November 8 BC), hoop driving was one of the manly sports. Ovid (20 March 43 BC – AD 17/18), in his Tristia is more specific, putting the sport in the same category with horsemanship, javelin throwing and weapon practice. It was also presented as a virtue by Cato (234 BC – 149 BC), who urged youth to “Play with the hoop, flee the dice.” A 2nd-century AD medical text by Antyllus, preserved in an anthology of Emperor Julian’s physician, Oribasius, (fourth century), describes hoop rolling as a form of physical and mental therapy. Antyllus indicated that at first the player should roll the hoop maintaining an upright posture, but after warming up he can begin to jump and run through the hoop. Such exercises, he holds, are best done before a meal or a bath, as with any physical exercise. The game was also a common pastime of African village children on the Tanganyika plateau, and not long after it is recorded in the Freetown settler community. In China the game may well go back to 1000 BC or further. In English the sport is known by several names, hoop and stick, bowling hoops, or gird and cleek in Scotland, where the gird is the hoop and the cleek, the stick. Among the games played with the hoops, besides simply trundling them which is a matter of driving them forward while keeping them upright, are hoop races, as well as games of dexterity. Among these are “toll,” in which the player has to drive his hoop between two stones placed two to three inches apart without touching either stone. Another such game is “turnpike” in which one player drives the hoop between pairs of objects such as bricks at first placed so that the opening is about a foot wide, each gate kept by a different player. After running all the gates the openings are made smaller by one inch and the player trundling the hoop runs the course again. The process repeats until he strikes the side of a gate, then he and the turnpike keeper switch places. Conflict games such as “hoop battle” or “tournament” can also be played. For this game boys organize into opposing teams that drive their hoops against each other with the aim of knocking down as many of the opponents’ hoops as possible. Only those hoops which fall as a result of a strike by another hoop are counted out. In some parts of England boys played a similar game called “encounters,” where two boys would drive their hoops against each other, the one whose hoop was left standing being the winner. 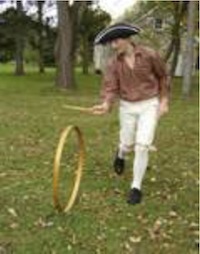 The “hoop hunt” is yet another game, in which one or more hoops are allowed to roll down a hill, with the double aim of rolling as far as possible and then of locating the hoop wherever it may have ended up. In Europe children are known to have played the game as early as the 15th century. By the late 18th century boys driving hoops in the London streets had become a nuisance, according to Joseph Strutt (1765–1844). The fuss over boys playing with hoops reached halfway around the globe. In the Colony of Tasmania boys trundling hoops were blamed for endangering horsemen and rending ladies’ dresses, and the Hobart paper called for their banishment to the suburbs. Not only schoolboys, but even graduate students at Cambridge enjoyed trundling hoops after their lectures. The practice, however, was brought to an end sometime before 1816, by means of a statute that forbade Masters of Arts to roll hoops or play marbles. In the mid-19th century bent ash was favoured as material for making wooden hoops. In early 20th-century England girls played with a wooden hoop driven with a wooden stick, while boys’ hoops were made of metal and the sticks were key-shaped and also made of metal. In some locations hoops with spokes and bells were available in stores but not popular with boys. A great number of widely separated Native American peoples played an ancient target-shooting version of hoop rolling currently known as chunkey. Though the forms of the game exhibited great variation, generally certain elements were present, namely a prepared terrain over which a disc or hoop was rolled at high speed, at which spears were thrown. The game when played by adults was often associated with gambling and often very valuable prizes, such as horses, exchanged hands. The game has been played by tribes such as the Arapaho, the Omaha, the Pawnee and many others. Since hoop and stick involves spear throwing it is thought to predate the introduction of the bow and arrow that took place around 500 BC. In the California region in the 18th century it was widespread and known as takersia. Canadian Eskimo players divide into two groups. While the first group rolls the hoops, a large and a small one, the players in the other group attempt to throw spears through the hoops. The Cheyenne named two months of the year after the game: January is known as Ok sey’ e shi his, “Hoop-and-stick game moon,” and February as Mak ok sey’ i shi, “Big hoop-and-stick game moon.” Among the Blackfeet, children would play the game by throwing a feathered stick through the rolling hoop. Salish and Pend d’Oreilles youth played hoop and arrow games “to become skillful at bringing down small game for the village” in early spring, when the men were gone in search of large game. Among the European settlers, hoop-rolling was a seasonal sport, seeing the greatest activity in the winter. Children, beside rolling the hoops, also tossed them back and forth, catching them on their sticks. In the 1830s hoop trundling was seen as an activity so characteristic of the young that it was adopted by a fanatic sect in Kentucky whose members mimicked children’s activities in order to gain access to heaven. Hoop driving was also seen as a remedy for the sedentary and overprotected lives led by many American girls of the mid-19th century. The game was popular with both girls and boys: in a 1898 survey of 1000 boys and 1000 girls in Massachusetts, both the girls and the boys named hoop and stick their favorite toy. In Ohio, the wood of the American elm (Ulmus americana) was particularly valued for making hoop-poles. The Wellesley College Hoop Rolling Contest is an annual spring tradition that dates back to 1895, and is only open to graduating seniors on that college’s May Day celebration. Dalby, Andrew; Empire of Pleasures: Luxury and Indulgence in the Roman World. Davis, Andrew McFarland. A few additional notes concerning Indian Games. Bulletin of the Essex Institute, VoL xvm, 1887. 8vo, p. 168. 8vo, 23 pp. Delaney, Madigan, The Sociology of Sports: An Introduction. McFarland Tim, Tim 2009. Groos, Karl; “Playful Use of the Motor Apparatus.” Chapter 2 in The Play of Man, translated by Elizabeth L. Baldwin. New York: Appleton 1901: 74-121. Mays, Dorothy A.; Women in Early America: Struggle, Survival, and Freedom in a New World. Santa Barbara, Calif. 2011. Smith, Sir William; Dictionary of Greek and Roman antiquities. …Charles Anthon Pub., 1841. Werthner, William B.; Some American Trees: An intimate study of native Ohio trees. New York: The Macmillan Company. 1935. pp. xviii + 398. Williams, Samuel; The Boy’s Treasury of Sports, Pastimes, and Recreations. Published by D. Bogue, London, 1844.